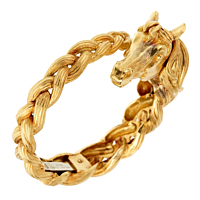 Magnificent showpiece is the definition for this stunning horse gold head bangle bracelet from Hermes. 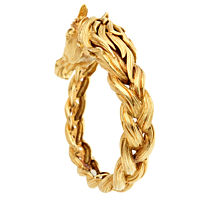 Crafted in solid yellow 18kt gold, the horse head bangle is distinguished by the horse head and woven mane, which gracefully evolves into the solid gold bracelet. Graced with a hidden hinged closure.